This phase of the project focused on enhancing the riverbanks, protecting the embankments from erosion and creating green areas. Our biodegradable blanket Biomac® SC was chosen for surface erosion protection by establishing vegetation on the embankments. 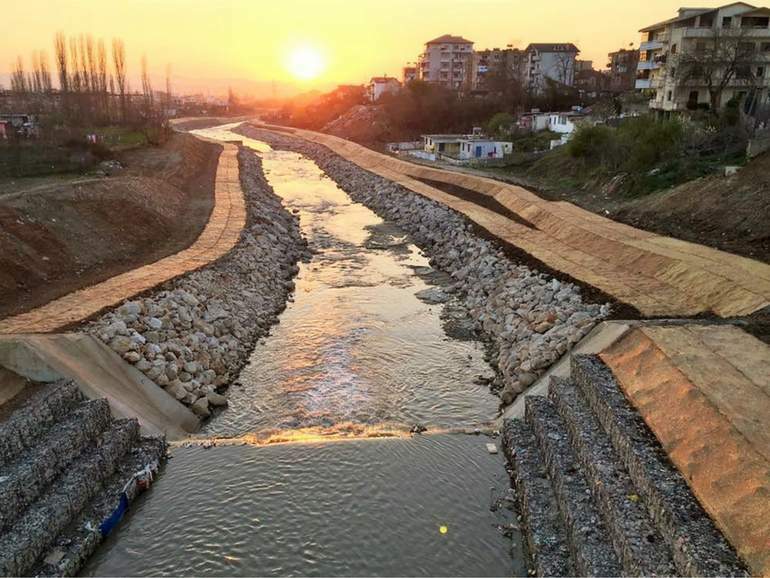 The Tirana Municipality project for the rehabilitation of the Tirana River is designed by Grimshaw Studio; the contractors for its implementation are Trema Engineering 2 and Strabag. The project envisions the enlargement of the riverbed and the creation of green areas on both riverbanks. Embankments will protect the urban areas from flooding. Upon successful completion of the first phase of the Tirana’s Northern Boulevard & River Project, during which gabions and Reno Mattresses provided protection and channeling works for the river and stopped the hydraulic erosion, the second phase of the project focused on enhancing the riverbanks, protecting the embankments from erosion and creating green areas. Our biodegradable erosion blanket Biomac® SC was chosen as the ideal solution for this project: it fulfills all the requirements set by the contractors by providing erosion protection and supporting the establishment of vegetation on the embankments. Also known as Rolled Erosion Control Protection (RECPs) mats, Biomac® blankets provide immediate protection to vulnerable slopes against the effects of erosion such as wind, rain and surface run-off. Placed onto topsoiled and seeded slopes, Biomac® supports the establishment of vegetation. As the mat biodegrades over time, the protection function is maintained by the vegetation. For this project, around 100,000 m² of Biomac® SC was used.